Issue #28 is now available! This issue marks the first appearance of fiction that I’ve selected since becoming one of the editors. I hope you enjoy them. 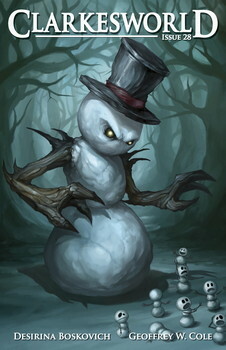 That is indeed one evil snowman!!! I’ve said it before, but you always have the very best covers around. Thanks! Serj does some great work and we’ve had a few covers from him now. I hope he does some more pieces soon. Yes, I did enjoy the two of them. I must admit though that I was disappointed by one of the non-fiction pieces. When I clicked on the link I found out that it was an article by people who do anthologies. Somehow I had misread the title as “Anthropologists discuss their craft”. Yeah, the betting money is definitely on this guy.